Many of the bespoke apps we build for our clients are specific to their business needs and so are not of interest to the general pubic. Sometimes they may also be new and innovative solutions, and in that case there could be a competitive advantage to not making them available to their competitors. This means standard app store distribution is not the right choice. In this post I will outline some really valuable alternative options that can help businesses make the most of mobile technology. The most common way to distribute an app is to publish it on the app stores, the Apple Appstore and Google Play being the big ones (though, alternatives are available). This makes it available for anybody to download. Simply search the app store for the type of app you desire and download away. This is excellent for any app designed for large numbers of consumers to use; for example social media apps, e-commerce solutions such as online ordering from supermarkets, mobile games and many more. However, there are so many other use cases that are possible, so many other opportunities for businesses to use mobile technology to solve problems and streamline their processes. An app can limit printing and distribution costs by sharing training materials or product information electronically, eliminate errors by recording information digitally and save time by sharing that information directly from device to device. These different needs require alternative solutions. This solution allows companies to distribute apps internally. 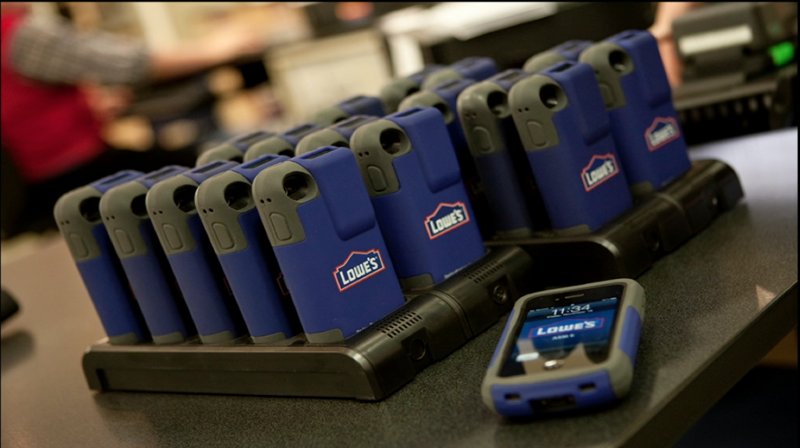 Mobile devices can be bought in bulk and dispensed to staff members. A designated person can be set up to manage all the devices remotely from their computer, dictating what apps can be added and removed and what features of the device can be accessed. Software is available to manage hundreds of devices at once either over wifi or using a bulk USB station to plug in groups of devices. The apps to be included on the device can be purchased from the app store as usual, or they can be tailor made for the business. These tailor made apps could be built by the company itself or by a third party provider like MultiPie. The company’s bespoke apps can be sent to just the devices that they own. They can also be managed and updated across all their devices from one computer. iPod touches in their bulk USB hub ready to be configured for work. This solution is a level of freedom up from the Enterprise Distribution programme. Perhaps the company has subsidiaries they would like to send their app to, or their staff use their own devices for work. The B2B app store lets organisations distribute an app to a select audience. The owner of the app can assign representatives from any company or subsidiary they’d like and those representatives can bulk purchase copies for the app. I use the term “purchase” loosely as the app can be free. They’ll receive redemption codes, which they can then send out to staff via email or SMS. The receiver simply clicks the link and the app will install. If supporting management software has been set up the representative can even send the app directly to devices and it will install as soon as the receiver accepts it. An example of such a scenario could be a distribution firm who employ contract drivers via agencies to deliver their goods. They commission MultiPie to build a time logging app to allow them to accurately see how long drivers spend on each delivery. MultiPie assists the firm in publishing the app on the B2B store and manages the process of giving a representative at the agency access to the app. The representative bulk purchases 100 copies and gives a redemption code to each driver to install the app on their personal phone. In the future if the distribution company began working with a new agency their project manager at MultiPie can add the new representative to the list of approved purchasers. Both the Enterprise Distribution programme and B2B store include a myriad of security features that let companies keep control of their devices and apps. Both will let app owners revoke a licence at any point, removing access from a user or device. With Enterprise Distribution you can even prevent devices from storing the app’s data in their memory. Perfect for apps that deal with sensitive information like patient records or intellectual property. Through the Enterprise Programme, combined with Apple’s management software it’s also possible to lock down a device to a particular app. This is most useful in any scenario where a company might be leaving a device in the hands of a customer. For example: a product catalogue on a shop floor, or an interactive tour app in a museum or gallery. Any attempts to exit the app will be ignored until the owner plugs it back into the computer. These solutions are provided by Apple for iPhone and iPad apps but they also apply to Android apps. Google has fewer restrictions than Apple, so there are even more permutations available of Android app distribution. If you’d like more information about how a mobile app could benefit your business, or you’d like to discuss a project give us a call on 0115 993 2357.